In all likelihood you've heard a radio or television advertisement promoting the treatment of something called "shift work disorder." Though this clinical diagnosis sounds like a ridiculous excuse for a disease, the drugs used to treat the disorder are not ridiculous in any way. Classified as eugeroics (meaning positive arousal), they are mild CNS stimulants with very few peripheral effects, and a lot of reason to believe that they can aid in boosting the cognition of even healthy and well-rested individuals. Adrafinil (Olmifon), acts as a prodrug for modafinil, a scheduled prescription medication. Other than adrafinil having a slightly longer duration of onset (it must metabolize into modafinil), the two drugs have an identical pharmacodynamics profile. Thus, many of the below mentioned statements are inferred from research on modafinil. Put simply, adrafinil can improve cognition. The foremost obvious effect is improving performance during a state brought about by lack of sleep. Imagine adrafinil as an "anti-Benadryl" (a common OTC sleep aid). Adrafinil elevates brain histamine levels (Benadryl, or dypenhydramine, is an antihistamine). Histamine is essential for vigilance and alertness. Below is a list of benefits. Imagine the first cup of coffee in your life. Now imagine that lasting twelve hours without feeling jittery. Adrafinil shares some similarities to classic stimulants such as amphetamine or methylphenidate, but uniquely triggers the activation of neurons in a portion of the hypothalamus responsible for regulating wakefulness. As with other stimulants, adrafinil can reduce appetite and promote thermogenesis. A 2008 study showed that it caused an average 28% decrease in calorie intake, but unlike stimulants, such as amphetamines, the dose effective for reducing food intake does not significantly increase heart rate. This could be seen as both a benefit or a detriment, depending on your athletic and health goals. Modafinil (adrafinil's metabolite) was shown to be an effective treatment for attention deficit hyperactivity disorder. There are near-proven mood-elevating effects. So effective that it is currently under review for treatment-resistant depression. When rats were exposed to a powerful neurotoxin (one that induces irreversible Parkinson's disease-like symptoms), the rats pretreated with modafinil showed no significant loss of "tyrosine-hydroxylase-immunoreactive cells," (a marker for dopamine neuron destruction) and it prevented the "decline in motor activity normally produced by MPTP treatment." For those still not convinced, the United States military has done exhaustive research on adrafinil and similar compounds. They have proven more effective at reducing the debilitating effects of sleep deprivation than the military's former benchmark wake-me-up, dextroamphetamine -- and with fewer side effects. The common daily dose is 300mg to 600mg, depending on the condition you're treating. Since the European prescription is dispensed in 300mg increments, it is recommended that most users start with 150mg to 300mg to assess sensitivity. Although adrafinil has fewer side effects than traditional stimulants, it shares similarities, such as an affinity for the dopamine transporter. So we suggest you assume major caution. These statements are not approved by the FDA, and you should always consult your doctor before consuming any drug. Caffeinated beverages contain the world's most widely consumed psychoactive chemical, and are usually consumed to restore vigilance. Caffeine acts by blocking the action of the inhibitory neurotransmitter, adenosine. This increases the release of many neurotransmitters, resulting in wakefulness. Both adrafinil and caffeine increase neurotransmitter release and produce wakefulness. The half-life of adrafinil is approximately 12 hours, whereas the half-life of caffeine is roughly five hours. This means that unlike caffeine, the average person only has to take a single dose of adrafinil for a full day of wakefulness. At the dose required for cognitive enhancement, adrafinil has negligible effects on blood pressure and heart rate. Caffeine, on the other hand, increases both heart rate and blood pressure, at even low doses. So adrafinil may be preferable for people who don't want sympathetic effects. With that said, adrafinil is still shown to reduce calorie intake and stimulate fat burning (lipolysis). Since ephedrine and amphetamine have similar MOAs (mechanism of action), it's simpler to compare them to adrafinil simultaneously. Amphetamine and ephedrine act as neurotransmitter-releasing agents, elevating many neurotransmitter levels (primarily dopamine and norepinephrine). Adrafanil, as opposed to causing a release, inhibits the re-uptake of these neurotransmitters. Adrafinil also elevates histamine in regions of the brain critical for arousal and wakefulness. Eurogics, such as adrafinil, also have the unique action of agonizing a newly discovered series of receptors known as orexin or hypocretin receptors. Adrafinil does not significantly tax the cardiovascular system. Amphetamine and ephedrine do this to a massive degree. Most importantly,evidence suggests that adrafinil does not share the same intense tolerance and habituations that amphetamine-based stimulants are known for. Although adrafinil appears much safer than traditional stimulants, many side effects have been reported. Because adrafinil is metabolized by the liver into modafinil, the side effects are similar. Also important to note, elevated liver enzymes have been reported with prolonged use of adrafinil. The median lethal dose of adrafinil is not known. The value for rats is approximately 1250mg/kg. No fatal overdoses have been reported, and suicide attempts (where someone consumed an excess of 5000mg) showed recovery within a few days without apparent long-term effects. Until September 2011, adrafinil was marketed in Europe as Olmifon. Group Lafon, a French pharmaceutical company, discovered adrafinil in the late 1970s. Adrafinil was then replaced by modafinil (the primary metabolite). Modafinil is approved by the FDA and marketed in the United States for narcolepsy, shift work sleep disorder, and excessive daytime sleepiness associated with obstructive sleep apnea. 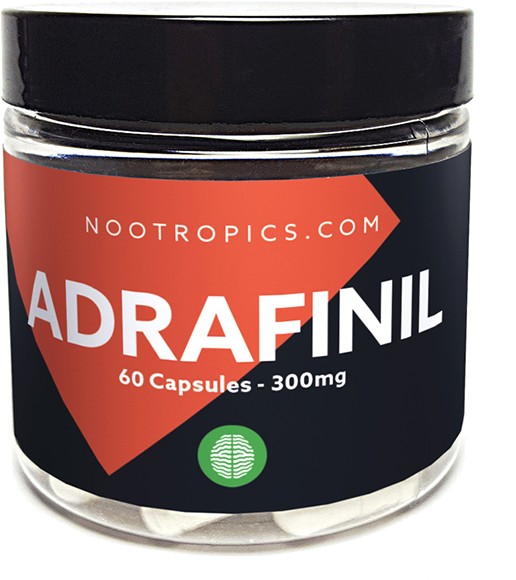 Many include adrafinil into nootropic stacks. It is important to note that these stacks should work outside of the catecholaminergic system (drugs or supplements that elevate dopamine and norepinephrine), as this could cause nasty side effects. Do not include stimulants with adrafinil because it's stimulating enough alone. Taking choline precursors, or choline enhancers such as a racetam, may increase the cognition-enhancing nature of adrafinil. This site is a price comparison engine, and we do our best to maintain trusted sources. "PROVIGIL(R) (modafinil) - Home". Cephalon, Inc.
"Modafinil Information Page" (PDF). Teva Pharmaceuticals. 2012-02-01. Sign up for future Adrafinil news! Click the button below to sign up for future Adrafinil news, deals, coupons, and reviews! $69.00 This is a Buy 1 Get 1 FREE offer!